This category lists all our herbal infusions, or tisanes except rooibos, which has its own category. All are caffeine-free except for the Mate blends. 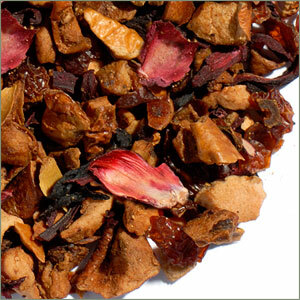 Apple Cinnamon Tea is a heavenly herbal blend of fruit and spice that yields an overall pear-like aroma and flavor. The cup produced has a delightfully fresh fruity character with delicious cinnamon notes. Makes a nice dessert substitute! 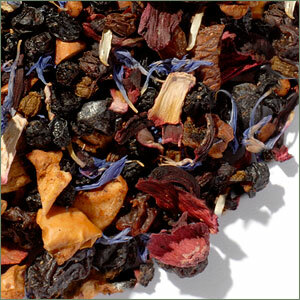 Contains apple pieces, hibiscus, rose hip peels, pineapple cubes, cinnamon bits, flavoring, and sunflower petals. Caffeine-free. Use one teaspoon per cup and steep 5-10 minutes in freshly boiled water. The rich and slightly sweet aroma of Ayurvedic Anti-Strain Tea makes this tea an ideal companion for anyone who needs soothing! 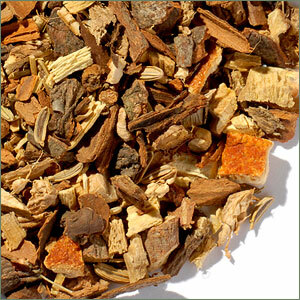 A caffeine-free combination of cinnamon, licorice, ginger root, fennel, orange peel, and cardamom. The naturally sweet taste is due to the licorice. Use one teaspoon per cup and steep 5-10 minutes in freshly boiled water. 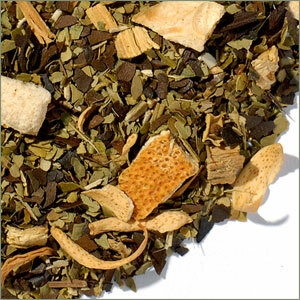 Brazilian Sweet Orange Mate is a blend of green and roasted Mate blended with licorice, orange peels and blossoms, and natural flavoring. Mate contains caffeine. Use 1 tsp. per cup and steep about 10 minutes in steaming water. 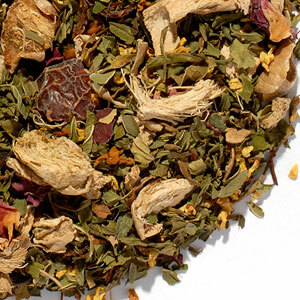 Casablanca Tea is a caffeine-free fruit blend that has a very exotic flavor profile. Think of a Saturday market where the fresh smells of various fruits tantalizingly blend in the air. 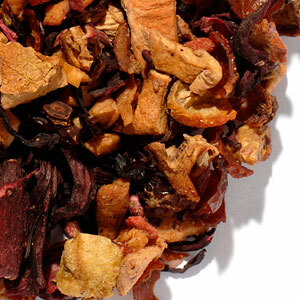 This tea is a melody of fruits with sweet notes of raspberry and strawberry that come to the foreground as well as tart flavors of more exotic fruits. 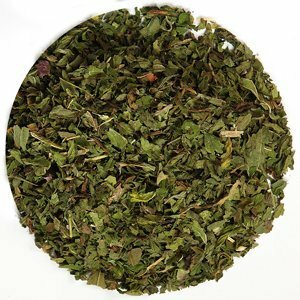 The delicious blend makes for a refreshing iced tea in the summertime or a hot summertime-reminder in the winter. 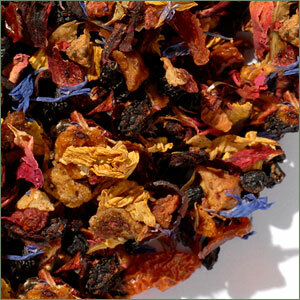 Contains dried apple pieces, hibiscus, rose hip peels, elderberries, raspberry, strawberry, kiwi, and passion fruit pieces, sunflower, cornflower, and rose petals, and natural flavors. Steep one teaspoon at least 5 minutes in freshly boiled water for a hot tea. 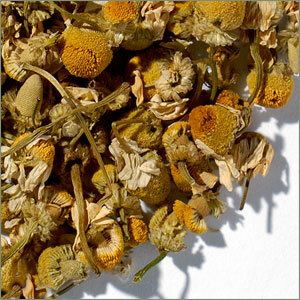 On its own, chamomile tea produces a sweet cup with notes of honey and subtle tones of apple. Lemongrass, which contains citronella, produces a cup that is fresh and herbal with light touches of bitter lemon and even lighter touches of orange. 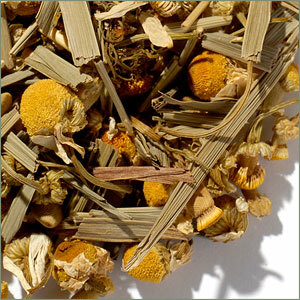 Together in our Chamomile Lemongrass Tea, the cup they produce is a heavenly blend of the two. A refreshing yet soothing caffeine-free blend! Use one heaping teaspoon per cup and brew 5-10 minutes in freshly boiled water. Fruit teas are considered a new type of "tea." 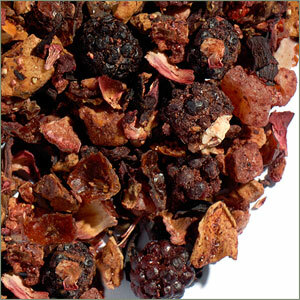 Many of our fruit blends, including Cranberry Apple tea, were formulated to accommodate the tastes of people who wanted to experience a refreshing drink without caffeine. This terrific "tea" is unbelievably delicious and enjoyed both hot or iced! 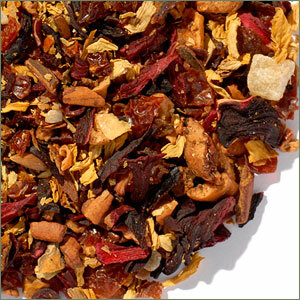 Cranberry Apple tea blend has a very exotic flavor profile due to the cranberry and apple flavors combining with the natural flavors and tartness of the various other dried fruit, and makes for a refreshing iced tea in the summertime or a hot summertime-reminder in the winter. 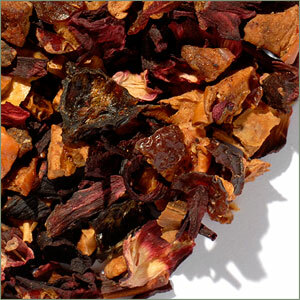 A full-flavored and pungent fruit blend with dried apple pieces, hibiscus, rose hip peels, and natural flavors. Caffeine-free. Steep one teaspoon at least 5 minutes in freshly boiled water for a hot tea. Can make a delicious mulled wine if you add a deep red wine, orange slices, cinnamon sticks, and cloves. There are several varieties and countries of origin of chamomile - sometimes referred to as "bachelor buttons" because of the shape of the flower heads - but the best quality comes from the Nile River delta in Egypt. The sandy loam and nutrients from the Nile create perfect growing conditions. Chamomile flowers have a yellow center and white petals - they almost look like a daisy. The essential oils in the flowers produce a pleasant soothing aroma and a fruity character. 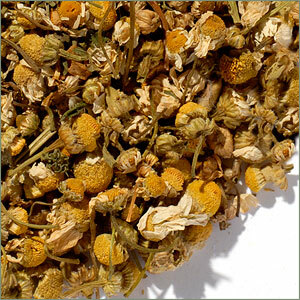 The word "chamomile" derives from ancient Greek and translates as "ground apple" in reference to the fruity aroma. Use a heaping teaspoon per cup and steep in freshly boiled water for 5-10 minutes. Mate (pronounced mah-tay) is made by brewing the dry leaves of the Yerba Mate tree, a small evergreen that is a member of the Holly family. 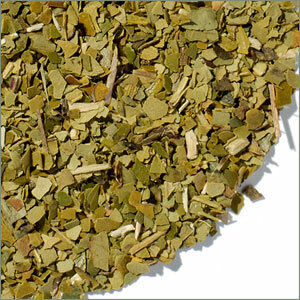 The tree is native to the subtropical highlands of Brazil, Paraguay, Uruguay, and Argentina, and it is in those countries that the majority of Yerba Mate is consumed. It has a vegetative character similar to green tea. Contrary to some popular reports, mate does contain caffeine, although many people report that they tolerate mate better than other caffeine-containing beverages. Use approximately 1-2 tablespoons per 3-cup pot and brew in steaming (not boiling) water for about 3 minutes. The best peppermint comes from the northwestern United States. The pure, moist mountain air of the spring and early summer growing season gives this peppermint some of the highest volatile oil counts of any member of the mint family. Generally, depending on weather patterns, the second cut (mid/end August) is the most flavorful, coolest, and most pungent. Our pure Natural Peppermint, farmed without pesticides, comes from Washington State and is the more flavorful second cut of the season. Caffeine-free. Use one teaspoon per cup and let steep 3-7 minutes in freshly boiled water. 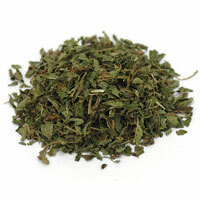 Spearmint is one of the most well known and commonly found varieties of the mint family, Labiatae. Its narrow leaves are deep green and its flowers are grouped together in spearhead formation. Mint is lovely when blended with lime, but also works marvelously with balm, anise, verbena, and orange blossom. It is a traditional drink in North Africa and the Middle East and is always served to welcome friends, family, and visitors from afar. Our pure Natural Spearmint comes from Washington State and is farmed without pesticides. Caffeine-free. Use one teaspoon per cup and steep 3-7 minutes in freshly boiled water.